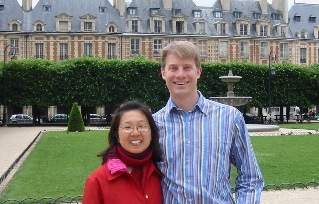 Early this year, we settled on a trip to France for our tenth anniversary. 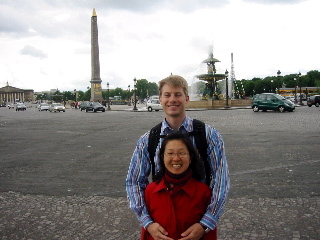 We had lived in the Paris suburbs for a little while as graduate students, and have always liked going back. 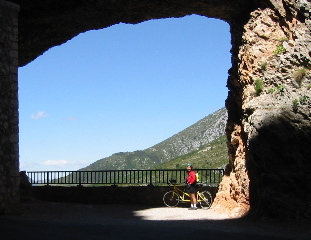 This time, we figured to spend most of the trip in Provence, famed for its rugged beauty and excellent cycling. 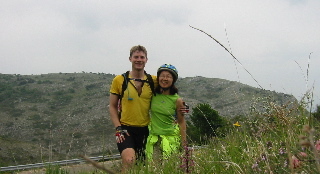 We could rent a station wagon, throw our tandem (1998 DaVinci Joint Venture S&S with Softride) in the back, and drive from one beautiful cycling area to another without fussing with luggage and trains. The kids could stay back in the USA with their grandparents. What could possibly happen? 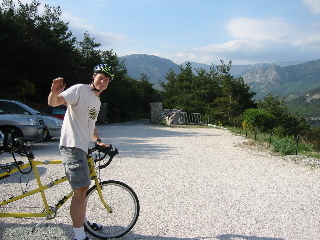 I did some research on the web, of course, but the most useful reference for planning trips was Cycling France. It is geared (heh, heh) toward those who plan to use trains and their own bicycle to get from place to place, so I had to modify some of its routes into loops from point-to-point. 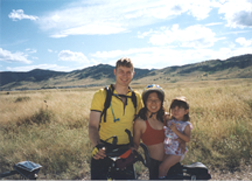 Realizing that we would be riding for long periods in the mountains, there were two major changes I thought we needed. First, our trip to Boulder CO two years ago, and the hot-hot-hot rims we got on the descents there, convinced me to buy a drum brake. Second, Amy has had trouble riding for more than an hour or so, due to RSI. 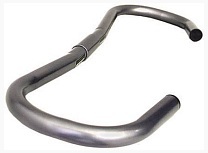 So I wanted to search for more ergonomic handlebars for her. I also made a short list of things we might need in Europe that would be unobtainable there, like extra-long brake cables, and a spare rear hub. The LBS convinced me that was overkill. I had hoped to buy an iQue Palm GPS unit as well, but they are not yet available. Our LBS is competent, but not brilliant with tandems. 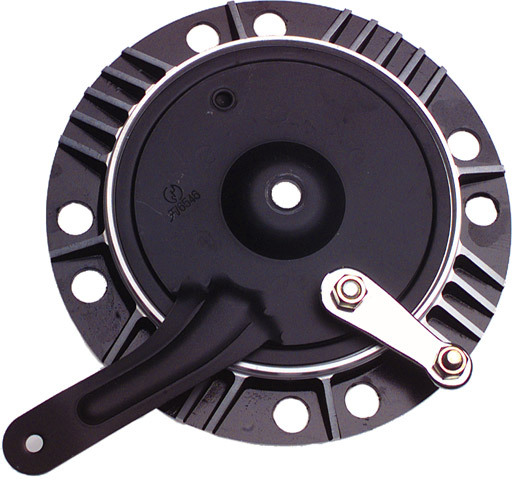 They had never seen an Arai drum brake before, so we were both a little unsure about what size to get. I called Todd Shusterman at DaVinci about that, and he knew, of course. 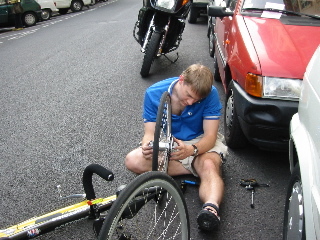 But even better, he had recently run across a quick-release for a Rohloff Speedhub that he reckoned he could modify for the drum arm. Todd is such an über bike geek that I could practically hear him cackling about how cool it would be. It meant we would have very quick releases for both the drum cable and the drum arm. To release the arm, you just push a little tab to the side. One second. It's really slick. We arranged for Todd to send the modified drum, and for our LBS to mount it. 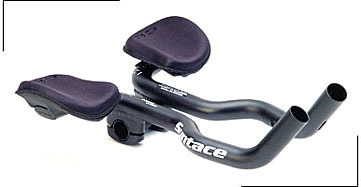 For the ergonomics, my first idea was to try drop bars, or other odd shapes, but after some experimental rides they did not help. So we tried some aero bars. Unfortunately, there's not enough room behind the captain's seat for most aero bars, so they didn't help either. We turned to the über bike geek again. I thought maybe I could buy some cheap mountain bars and use a pipe bender to bend them up into a position she found comfortable (despite the fact that bars are specifically designed not to bend). Todd reckoned they would crimp if I did that, and generously offered instead to machine something in the right shape for us within a week, as the departure date was imminent. I'm happy to say that after many hours on the road, the new bars are just perfect! Amy hasn't had any fatigue or pain since we switched. There were four parties the weekend before we left, including a big one we threw for Kepler's first birthday. 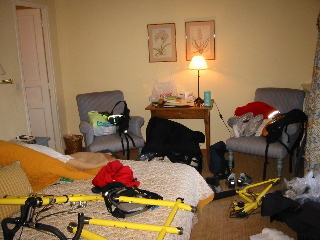 By Sunday night, it was time to pack the bike, and I was exhausted. I took my time packing up, though. I was worried about damage to the drum brake, so I figured maybe I should take it off. Never do that unless you know your hub! I failed to loosen the set screws on the brake side. Thus, I ended up pulling the press-fit end cap off the drive side of the hub. The forces involved did more damage than that, too, since when I put everything back together (with the help of my friend Anton), the hub would no longer freewheel. Now I was worried. I had a zillion things to wrap up at work, a problem with my rear hub, and 40 hours until our flight. Amy agreed to bring the bike into the LBS while I was at work. They took the hub apart, reassembled it, and said everything seemed fine. No charge. What a relief! I managed to pack the bike in our soft-sided case in a way that seemed safe for the drum. I usually pack the beam (and sometimes the captain's handlebars) in a separate duffel. The rest of the bike fits pretty easily, with room for shoes, bottles, etc. Usually, I put clothes in the side pockets. This time, to save weight, I packed the empty spaces and the side pockets with styrofoam panels and those air-packs you get from Amazon and other online stores. That worked nicely. Borrowing an idea from the mailing list, I locked the zippers with zip ties in an unusual color of blue, so I would be able to tell if the security people had opened the case. I was also careful not to pack any electronics in the case, to keep it as innocuous on the x-ray belt as possible. Our flight to Nice was relatively uneventful. We missed our connection in Frankfurt, but made the next flight a few hours later. By 3PM we were in our hotel, just a block from the water. The weather was truly beautiful -- high 70's and sunny. Amy set out to buy a cell phone, while I assembled the bike. We headed to the Marche aux Fleurs for dinner and our first bottle of Provençal wine. Street performers entertained the crowd (and the wait staff, who apparently are not expected to tip). We had a guitar player, an opera singer, and a very funny(!) mime. 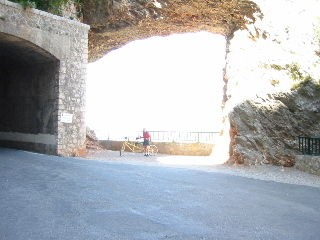 The next day, we set out for our first ride, an easy 35k jaunt from St. Raphael to La Napoule. I could tell something was stiff inside our rear hub, but the bike seemed rideable, so off we went. The ride was not as pretty as we had hoped. I had envisioned something dramatic like Highway 1 along the Pacific. Instead, most of the coastline was built up, so we just had a road on rolling terrain with occasional glimpses of public coves. After about 7k, the drum brake started dragging. I thought that was very strange, and we got off to check it out. I found that the skewers were wicked hot! The heat had probably caused the drum to expand. I decided right there we should ride the hub no more, and we locked up, caught a bus back to our car, and came to pick up the bike. I took off the front section and we put the bike in the back of the station wagon. Amy started calling bike stores while I drove us back to Nice. I was rather disappointed with the quality of the bike shops there. One place we went was willing enough to help, but was so slow to grasp the design of the DaVinci drive that I worried about their competence. The other said on the phone they were willing to help, but reversed themselves as soon as I walked into the shop, without even taking a look. 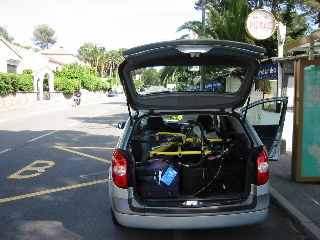 Instead of a little help with sleuthing the problem, I got a lecture (in French) on how I shouldn't come to France with a bike having such an unusual part without bringing a spare. I asked if there were tandem specialists anywhere in France, and they gave me the number of a place in Marseilles. I called them, but apparently European tandem hubs are narrow than American ones. I reckoned I was going to have to solve this myself, so I asked the store what I would need for disassembly, and they sold me one thing I didn't already have with me -- a Shimano Hyperglide lockring socket. We drove to a quiet street, where it was finally late enough in the day that we could place a desparate call to Todd at DaVinci. He talked me through disassembling the hub the right way, while I sat in the middle of the street following his directions (you can see I'm cradling the phone on my shoulder). We could not sleuth the problem together, so (after some calls to Doug and Jeanette at White Industries), we arranged for a new hub to be sent from California. This would take 4 days. I had planned for some days off, but not so many in a row! 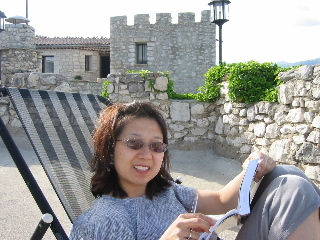 That night, we ate paella in the Marche aux Fleurs, and drove to our hotel, the Relais Cantemerle in Vence. It is part of a chain that call themselves Relais du Silence, so we had fun shushing each other any time either of us talked. This got funnier and funnier the longer we stayed there (and seemed also to be correlated with our wine consumption). 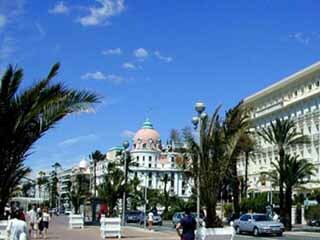 Friday, Amy went shopping at Galeries Lafayette in Nice, while I hung out on the boardwalk. We ate at the Marche aux Fleurs one last time (pizza), and then headed back to Vence. 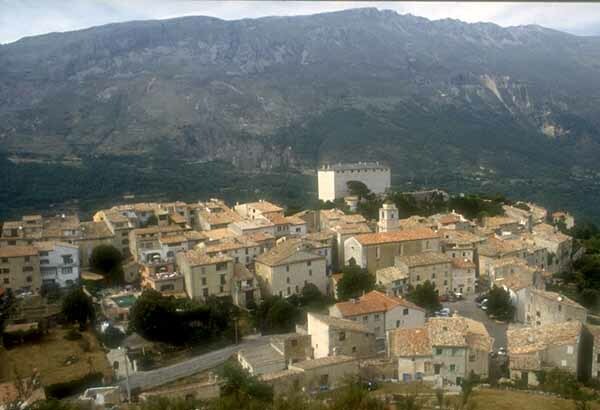 Saturday morning we rented two singles, so that we would at least be able to do one of our Vence circuits. This would be about 70k in some occasionally steep terrain, so we also borrowed a bungee cord to simulate a tandem on the uphills. 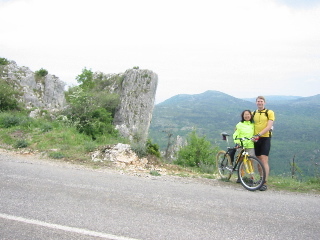 We started at Gourdon, then headed up on a long climb to the west. Soon, we were on tiny roads with cars going by at 15min to half hour intervals. The weather was cool and a little cloudy, but the roads were wonderful. At about the halfway point, Amy got a little bit too much confidence downhill and picked up a helmet dent and some road rash on one of the switchbacks. I had brought along a medikit just in case, so we were soon on our way. 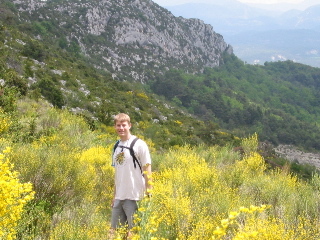 We climbed above a steep dropoff and headed toward Gréolières. 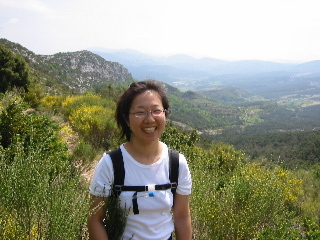 By this time (5PM), Amy's fatigue and acrophobia were getting to her. After a quick lunch there, I left on my own to fetch the car, while she stayed in the lone open cafe. They would close at 6PM, so I knew Amy would have to wait outside for a little while while I was underway. 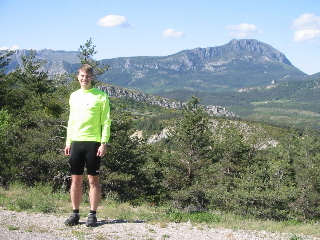 I headed quickly through Cipières (you can see Gréolières in the background) and on to Gourdon. Meanwhile, Amy sat in the town square, where she had a conversation with a dignified old woman who ran a pottery store. Amy was surprised how well she spoke English, and the potter told her, "Well! You know I went to universeetee!" Once I picked Amy up, we drove back to the Cantemerle for one last night of wine, shushing, and giggling. This is a boy we asked to snap our picture. 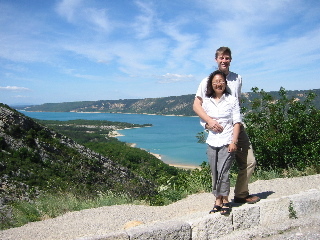 Sunday, we headed for our next stop, the Grand Canyon du Verdon and Trigance. Let me say in advance that this was easily the best part of our trip. 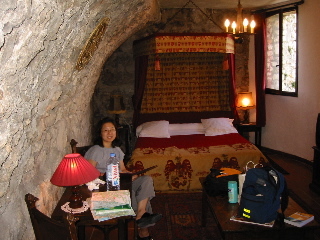 We stayed at the Château de Trigance, in a room incorporating one of the old castle walls. 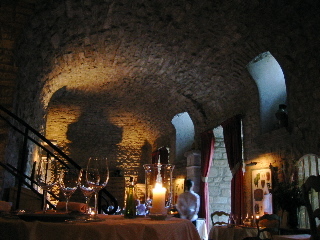 The whole place is surrounded by a national park that includes the canyon, the castle is beautiful, the scenery spectacular, and, though you are far removed from other towns and restaurants, the chef at the Château is excellent. We spent the rest of the afternoon relaxing and enjoying the view. Monday, we ate breakfast up top again, and decided to take a little hike for the day. I asked the hotel to give us a call when the new hub arrived, and we set out on a footpath into the hills. 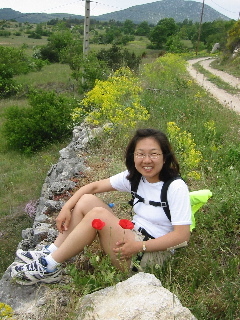 There were wildflowers blooming everywhere, and the weather was excellent. We got a little lost and had to call back to the hotel for directions, but made it back in good time once we heard the hub was in. 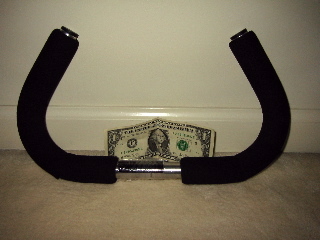 My hope, once I got my hands on that hub, was to cannibalize it for parts and use the old hub shell. Re-lacing the wheel would (in this part of the country) mean a delay of two days or more, if I could even find someone who would agree to do it on short notice. Happily, as it turned out, I needed no more than the excellent instructions that came with the hub, and the tools I had to hand. I left the drum brake off, in the interest of keeping things simple. I'm still not sure what was wrong with the old hub -- I might have bent the pawls a little -- but the new parts work just fine. What a relief! Tuesday was windy and cool. It had rained the night before, and the Mistral had started. We drove to Comps-sur-Artuby, and made a false start on the D955, where we saw a huge flock of sheep walking on the road. Amy thought they were very cute, but we needed to turn around. 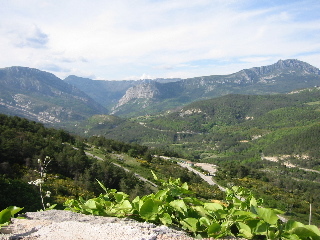 We headed back to ride the D71 into the teeth of the Mistral, stopping at Balcons De la Mescla. The road goes along the south rim of the canyon, climbing then descending to the dizzyingly high bridge over the Artuby. Some of the wind gusts were incredibly strong, especially near the tunnels. The ride itself was every bit as dramatic as we had hoped. It was amazingly traffic-free. According to the people we talked to, this is one of the slowest months of May they can remember, and that worked to our advantage. Usually the D71 is packed with RV's but for us there was hardly any traffic at all. Nevertheless, by the time we had nearly reached Aiguines, we were getting tired, so rather than eating there we headed back and ate a late lunch at the Grand Canyon Hotel. Just before the final descent back to our car, we stopped for a victorious photo shoot. Thanks to the folks at DaVinci and White Industries, we had finally gotten to ride together. It's hard to see, but we actually had Trigance in the backdrop. By Wednesday it was already time to leave. 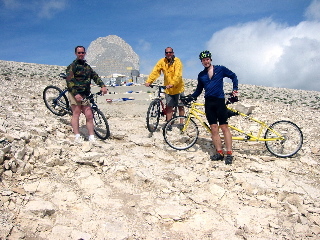 We were sad to go, since the castle had been so great, but Mont Ventoux was calling. We first drove along the north rim of the canyon past Lake St. Croix, but then realized we had forgotten our passports. 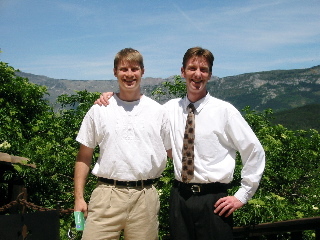 We needed to go back to the hotel, where I got a final picture with the owner, Guillaume Thomas, and then were off to Crillon-le-Brave. Having noticed by now that I had somehow lost our S&S bracket tool, we stopped off in Avignon to pick up a bottom bracket tool, which Anton had mentioned might work to get the couplers loose. We went to a huge sporting goods store, Decathlon, to look for it. 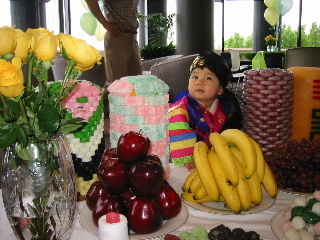 I was amazed. In America, if you need competent bike help or unusual tools, you go to your LBS. Anything bicycle related in a sporting goods store is highly suspect. In France, the best selection and (I am told) best mechanics are all at these huge chain stores. They had the most esoteric parts you could imagine, shrink-wrapped and on racks like batteries at the drugstore. We checked into the hotel, and then headed to a restaurant (Les Geraniums) we had been to a decade before with our German friends, the Niepers. It was just as good as we had remembered, though I wanted no wine and stuck to water since I was driving us home. 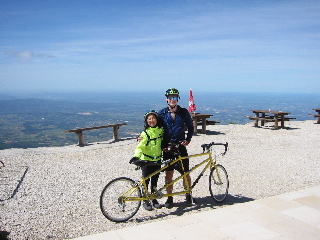 Thursday morning, we decided there was no way we would make it all the way up and down Mont Ventoux in the time limit Amy had set for our rides, so we drove up to the Château Reynard, and rode the tandem up the summit road, about 4 miles to the top. It was extremely windy and a little cold, but were dressed for it. After coming back down (stopping four times to cool the rims), we got back in the car and headed to Bedoin for lunch. After lunch, I removed Amy's cranks, beam, and handlebars, since I wanted to climb Ventoux all the way. Right after removing those items, some kids came up and asked about the bike. 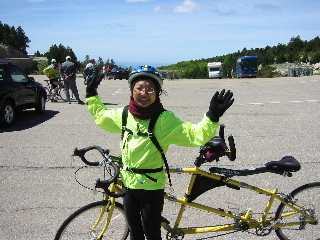 We explained that it was a tandem, for two people. They were perplexed, and asked where the second person sat, and I had to explain and show them the beam and saddle Amy uses, by taking them back from the car. Then they asked how the stoker could pedal, and I took out the cranks. Then they asked what the stoker held on to, and I had to take out the handlebars. Man, those kids were savvy! 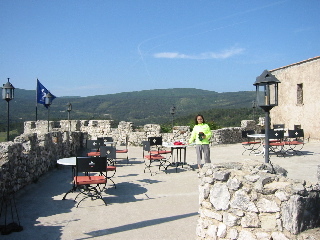 After they left, I left Amy to enjoy Bedoin while I headed up Ventoux again. 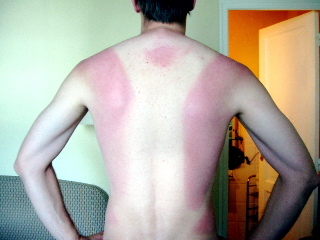 I had forgotten to bring a short sleeve jersey, and it was so hot I had to take off my long-sleeve jersey. I knew that would earn me a nice negative-Camelback sunburn, but it was worth it. On the way up, I was passed several times by shrouded Mercedes cars towing other cars up the mountain. I think they were stress-testing the engines. I reached the summit again (stopping at the Tom Simpson memorial along the way), and pointed back in the direction I had come for a fast, exciting descent. Without Amy on the back I was a little slower of course, but I didn't have to stop and cool rims. I let a car pass me early, and then stayed a couple hundred meters behind it most of the way down. 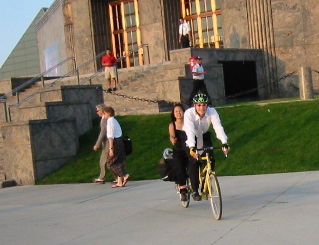 We don't have a speedometer, but judging from my cadence we were doing over 50 mph at times. Having the car in front was really nice, since it telegraphed curves and traffic. That night, I packed up the bike. To get the couplers loose, I used the bottom bracket tool, but not in the way Anton intended. It just didn't fit. Happily, I had brought along a pin punch with a 2-3mm tip. Using the bottom bracket tool as a hammer, I tapped the couplers around until I could work them by hand. It also struck me that a strap wrench might have done the trick, but of course there was none to hand. After all that riding and packing, we were ready for a quiet dinner in the dramatic Crillon dining room. They were serving bull beef, of all things. 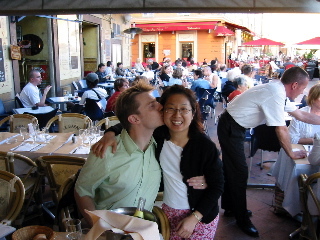 On Friday, we drove to Avignon, turned in the car, and took the TGV to Paris. 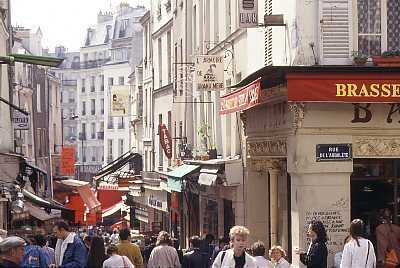 We checked into the hotel, and rode the Metro to Rue Mouffetard in the Latin Quarter to find a restaurant. The area was so full of good looking ones that we resolved to eat there every night. Saturday was shopping day. For me, that meant a trip to the Musee d'Orsay and quality time with my book in various cafés around the city. Amy didn't quite manage all her purchases, since our credit card company turned off the card, and the other card was back at the hotel. We had told them we were going to France, but they had not properly made note of it. Still, it was kind of weird to stop it then, after we had already charged so many hotels and dinners! Sunday we walked from the Vosges to the Centre Georges Pompidou area, sat for a while in Cafe Beauburg, and took in a Magritte exposition at the Jeu des Palmes. After that, we decided to see the new Matrix movie (with French subtitles). The theater was huge and packed, and the audience was clearly ready for a spectacle. There must have been 1000-2000 people there! After, we headed off to Mouffetard for a final dinner before leaving France. 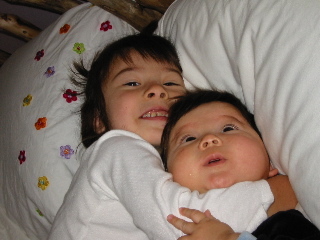 We left Monday morning, a day before the airline strike would make it who-knows-how-hard to get out of the country.